There’s a lot of information on the Interweb about how to write a functional specification (FS for short, aka software requirements specification, system specification, product specification. What I have struggled to find, though, is a good, detailed description of what should actually go in an FS and, in particular, to what level of detail. When asked this question, most BAs answer, “it depends”. Whilst this is true, I think we can improve on it by drawing some clear boundaries around how much detail is allowed, and how much is too much. Therefore, I present a specification for a functional specification. This my own view and by no means an industry standard, but it works for me. What Document are We Talking About? Let’s be clear. I’m not talking here about a high-level business requirements document or a wish-list of stakeholder needs that may or may not be achievable, and which might even conflict with one another. The document I’m talking about here is the result of the synthesis of those needs into a coherent view of what the system will actually be. Now before you start getting all agile on me…no, I’m not advocating a “throw it over the wall” approach to delivery, and I’ll talk later about the various forms that an FS can take. I just want to be sure we are all talking about the same thing. Oh, and whilst we’re at it, let’s not call it a document. It might not be a single monolithic text-and-diagrams epic. So let’s just call it a thing, or even better, let’s go plural: things. I’m also primarily talking about the specification for a system that is to be built. Such a specification is not generally appropriate for a system that is to be bought off the shelf. That definition might sound a little too simple to be true. Surely there’s more to a system than just what the users see. You’re right, there is. And once I elaborate on my definitions of system and externally-visible behaviour (specifically, I don’t mean just use cases), hopefully you will agree with me that the definition is both complete and precise. Interfaces, through which external entities can interact with the system via a series of inputs and outputs. There are two types of external entities – humans and other systems (also collectively referred to as actors of the system), and we need to worry about them both. State, which changes as a result of interactions with the actors. Think of this as the system’s memory, in which it remembers (or stores) data – usually implemented as a database. This simple definition applies to pretty much any system you can think of. All systems have interfaces – without any interfaces, a system is just a rather uninteresting black box! Most systems have (human) user interfaces, but I’ve also worked on plenty of data processing systems with no UIs – they just take data from one system, process it, and pass it on to another system. Some systems do not have any system interfaces, but in these days of end-to-end integration, most systems do. Some very simple systems do not have any state, although most interesting systems do (any system that manages data has state). One of the most important things to get clear for a system under design is where the system boundary lies, and you can do that easily by identifying its interfaces with the outside world. 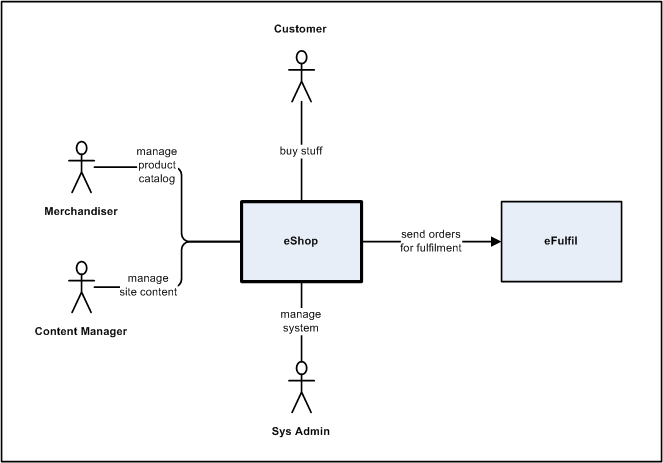 Here’s a simple diagram of a system (called eShop), showing its interfaces and the actors that use those interfaces. I call this a context diagram. Once you have described all the functions and all the data (to the right level of detail), you are done – simple as that! The functions of a system are the interactions that can occur between the system and its actors (through the interfaces). An interaction is a sequence of actor inputs (e.g. a user clicking a mouse button) and system outputs (e.g. displaying some data on the user’s screen). Typically the actor is trying to achieve some objective (log in, search for data, update data, perform a calculation etc.). I’ve omitted some of the key parts of my use case for brevity (e.g. pre- and post-conditions), but you should be able to see that it describes the sequence of inputs (by the user) and outputs (by the system) for a given function. For more info on use cases, read Writing Effective Use Cases by Alistair Cockburn. Note that the example use case shows interactions both with a human user and also an external system (the single-sign on directory). In order for your use cases to be complete, you need to cover all the interactions through all the interfaces, whether they be human user interfaces or system interfaces, in particular including any “back-end” systems. It’s also important to understand that use cases do not give a fully-detailed description of the system’s functions. Rather, they are the anchor for the functions, around which the other details can be added. Adriana Beal has some additional comments on this topic in this article. [Update 20/10/2014] An alternative notation to use cases which is gaining popularity (especially in agile circles) is “gherkin” notation, also known as given-when-then scenarios, and strongly associated with Behaviour Driven Development (BDD) and Test Driven Development (TDD). As far as I am concerned, given-when-then scenarios are pretty much equivalent to use cases, as I discuss in this article. Functions – How Much Detail is Allowed? OK, we’ve done the easy part – most people agree that use cases rock, and all I’ve been doing so far is setting the scene. The tricky part is deciding how much detail to include either within the use cases or alongside them. You are allowed to include full detail of any externally-visible behaviour of the system (including behaviour through system interfaces). You are not allowed to include any details on the internal workings of the system. Some people will argue that some of the above examples are aspects of the design, and have no place in a requirements specification. There’s a long debate on this topic in my previous article, Requirements Versus Design: It’s All Design. But whatever terminology we use, my experience is that business stakeholders, developers and testers care about these details, and thus they have every right to be included. In particular, the UX design might be put in a separate document, maybe even produced by a separate person (a UX designer), but in my world-view, it is still part of the externally-visible behaviour and thus part of this “thing” or “things” that I am calling a Functional Specification. These are slightly more controversial because they are of little interest to our primary business stakeholders, and certainly have a “technical” aspect to them. Nevertheless, they are externally-visible behaviours of the system and are of interest to other stakeholders – a sys admin, or the developers of an external system. Such qualities are commonly referred to as non-functional requirements – a term which I really dislike because they are so obviously not non-functional. But the term is pretty-much ubiquitous, so I guess we’re stuck with it. First of all, let’s resolve a contradiction. I’ve said that the FS should describe the externally-visible behaviour of the system. But the system’s state isn’t externally visible (unless you go poking around in the database), so why include it? The answer is that the system’s state has an important effect on its functions. A function which updates the system’s state has a delayed effect in that it affects any other function which outputs the same data. Functions and data are intertwined and you can’t really describe one without the other. The usual way to describe system data is in terms of (logical) data entities. An entity is a “thing” of interest (a customer, an address, an order, a product). Entities have attributes (a customer has a first name, a last name, a date of birth etc.). Entities also have relationships with one another (a customer has one or more delivery addresses; a customer has zero or more orders; an order consists of one or more products). Data – How Much Detail is Allowed? OK, So How Much Detail Do I Actually Include? So far, I have stated the level of detail that, in my view, is allowed in an FS. The obvious next question is whether you actually need to write down all that detail. And here’s where we get back to the original answer – “it depends”. However much detail I decide to include in, or omit from, my written specification, I am always clear where the boundary of my accountability lies – I am accountable for all externally-visible behaviour of the system – so if I choose to leave some detail out, I accept that I am giving the developers some free reign, but that it’s my problem if the stakeholder doesn’t like it! And What Format Do I Write It Down In? Regardless of the format used, the same rules about type of content and level of detail still apply. So far I have said that a functional specification should only describe externally-visible behaviour. I have already made a minor exception to this rule by including the system state, which is kind of internal. Extensibility requirements – how easy it must be to extend or alter the system. This is a whole topic in itself. I try to treat these very much as exceptions to the rule and only include them where they are absolutely necessary. There’s more to business analysis than just writing Functional Specifications. I’ve tried to capture the end-to-end process I follow in the article Business Analyst Designer Method. And if you want to learn how to put what you’ve just read into practice, you might want to look at my Distance Learning Course. This entry was posted in Articles on November 23, 2011 by Tony Heap. My name is Thrigun, from Bangalore, India. Am working as business analyst in health care domain. 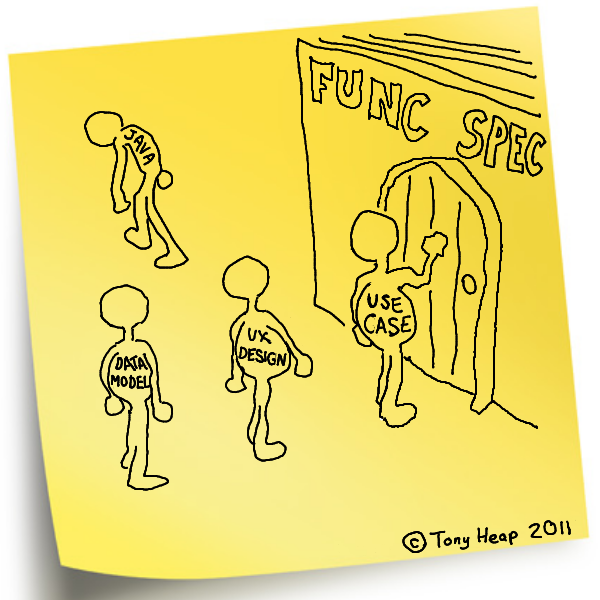 I liked this blog written by you because even i have experienced similar thing when it comes to writing functional spec; the format, use cases, data fields, wireframe design etc. This is a great infor you provided as its from your experience. I have written functinal spec with most of the details you have mentioned. I liked the way you have defined a functional specification, its main elements- function and data and one use case believe me i have written same way i mean the format you have mentioned its the same i used to write and i learnt this from my experience in my previous organization. 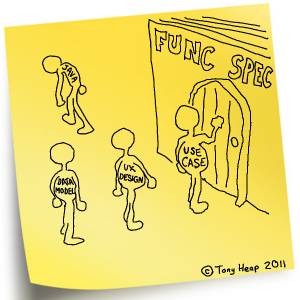 Pingback: What Actually Goes in a Functional Specification? I like how you have broken down the functional specification into two key elements: functions and data. You have explained very nicely that even though data (state) is not really a externally visible feature there is an important relationship between the functions and state due to the fact that functions alter the state of a system. This explains with greater clarity the importance of data requirements. I also like that you mentioned when it is appropriate to deliver an FRS, i.e., when a system is being actually built as opposed to being purchased off the shelf. Interesting statement about those non-functional requirements being a misnomer. I will have to think about that one. Food for thought which might start a new debate! Great article! Agree with your view absolutely. I don’t normally mention default values. I prefer to specify the values to give each attribute of a newly-created entity explicitly as part of the appropriate use case(s). What an amazing article. I really like how you’ve broken down why you include specific details and how you’ve found things to work well for you in the past. I bet this one proves to be a standard-bearer. Nice work! Love this post Tony! I was not clear..were you saying the data, and UI should be in the form of a Usecase?? Also i just finished a project on a new “Employee BOnus program” currently done by hand by the HR team. So I did do a Highlevel “AS-IS” and “To-Be” diagram in visio. Then in the detailed requirement-I did the requirement for each screen and calculations. Plus it had a dictionary with the bonus computations. Question-I had no usecases because I was thinking the MEAT of the project was on the new program to process bonuses not the roles of the actors because their roles were the same as before. So based on your article should i have done “system” usecases showing the sequence of how the data went from the Payroll system, HR system to the Bonus system to the check printer???? If so would I not just do a process flow diagram vs a usecase in this type of project? I’m not going to attempt to give a full description of use cases and when & how to use them (for that you need to read Writing Effective Use Cases by Alistair Cockburn). The main thing I want to clarify, though, is that when I say a “use case”, I do *not* mean a use case *diagram* – I mean use cases in their written form, describing system functionality in detail. I don’t generally draw use case *diagrams* – I find they don’t usually add much value. A process flow diagram (or flowchart) is a good alternative to a (written) use case, and I have had some recent success myself using flowcharts to describe system functionality (there’s an article on its way!) Each box in the flow chart is the same as a single step in a use case flow. The main thing is to make sure you get the right level of detail either in, or with, your diagram. I am not sure if I can make a distinction about “which model” to use but I will note that there is a BPMN which in turn feeds into Business Process Modeling systems (BPMS). This is all visual and modeling and there is at least one free editor/process modeler out there as well as a free BPMN addon for Visio. If there’s one thing I don’t like it’s a business rules catalogue! Whenever I have seen one of these it’s always been an unstructured pick-list of some subset of the requirements that occurred to the author or stakeholder at the time. I much prefer to describe the system behaviour as sequential steps (either verbally as use cases or graphically as process diagrams) and include the relevant aspects of the system behaviour along the way. Importantly, I make sure that the “rules” are associated with the relevant step, not just written down as an unstructured/unordered list list. With written use cases you can include the detail within the use case text (perhaps indented to separate the detail from the main purpose of each use case step), or as footnotes (although this can get messy if there are too many). With process diagrams, I include the details in call-outs attached to the relevant process steps. The key trick here is to get the look & feel of the digram right – the notes need to me small & discrete so as not to detract from the main process flow. I tent to use a smaller font and a mid grey colour, so that the notes fade into the background unless you actually focus your attention on them. One of these days I will finish that article! Thanks for this Tony, I really appreciate your advice. You’ve given me some useful info here. I quite agree with your view on rules catalogue and I’m not sure the developers I’ll be working with would appreciate a ‘catalogue’ either. I’ll definitely look to start annotating the process with call outs, think that’s a great tip and one that will no doubt help maintain the overall picture of what we are trying to achieve. Thanks again Tony. Great Read Tony – many thanks. I read this with interest because I wanted to find out what is in an FS, thinking this is the type of document I need for my project. But it turns out, maybe not. We’re implementing a COTS system but it requires a degree of integration with legacy IS Systems – such as LDAP or Active Directory and I thought the FS was a way to describe the why the business want to use this technology and what the end result would be. Is this still called an FS? I also agree with your business rules method. I also use Viso a lot to draw the use case, or flow and number the boxes, I then have a narration document to go with the numbering which gives me enough room to explain in more detail behind the box, including any rules. I find this way easier than putting them on the flow it self. It also gives people the option of those who perfer text over diagrams and visa versa. Use cases themselves with Actors and boundories and things have completely confounded me and I can’t use them at all!! I have tried many many times. I’m working on a COTS implementation for a large retailer at the moment, including a whole bunch of legacy integration. 1) A “solution overview” doc – this identifies the various applications (COTS and legacy) and shows how they interact in general terms. It also lists the business processes that are impacted by the new solution and summarises how they are changing. 2) The business process models. These are swimlaned flowcharts showing how each business process is executed, by whom and using which systems. It also shows the automated steps (including where data is transferred between new COTS and legacy). These models go down to what we call “level 4” detail – one level above full detail – the full detail isn’t needed because it’s in the COTS user guides. The models also call out which process steps are changing and which remain as-is. 3) Functional specs for any system integrations or COTS modifications – i.e. anything that has to be built from scratch. Curious to know where you would include the details of how a COTS system is configured to meet business needs? When I read your article a few months ago, I felt as if you were describing my woes. I used to produce wonderful, detailed specifications, that no-one read. It was just too much to wade through the document. I followed your advice and have just used the template to spec a new system. It is much easier for me (it helps me stay logical), and much easier for the developer to follow. I don’t believe in blindly following rules, and always adapt to the current needs. Thanks for providing a basis to work on. My absolute pleasure Jacqui. Glad you found it useful! Jacqui, what… “used the template to spec a new system” template? Click the link within this article to *A Graphical Functional Specification – Part 2*, and then click the link in the paragraph *You can download an example graphical functional specification in both PDF format and (zipped) Visio format*. I suppose that I should have added the comment there. I totally agree with you on where to draw the line….I have described it up until now as those things that directly impact the user’s experience. Your article gave me another way of articulating it. Thanks for your insight! COTS is different – in this case you often see a config spec rather than a functional spec. The config spec would be agreed with the customer, since the configurations typically affect the user-visible functionality. Thanks, Tony. Couldn’t agree more. You’ve nailed it very simply, clearly and pragmatically. Good article. I also add input/output of attibute and mandatory level. Thanks for this great story. I think you can put it even simpler: A FS should contain all information that a developer or team of developers need to develop a product that meets the customers expectations, without having to go back to the customer later for more details. Every little detail the customer cares about, how stupid it may be, should be in there, for the developer to make a product the customer likes. The other way around, if the customer doesnt care, and the developer doesnt need it, or can decide for himself, it should not be there. This is of course not 100% realistic, but it should be the target, imho. This definition includes your division into interfaces and state, without describing these it is impossible for a developer to develop the application. Developers are not usually great readers. Put in whatever they need to get the job done correctly and make sure that you are available to provide all the other input to help them. They are not business oriented, you are. Amazing article. I would like to know what would your answer be if you have a COTS solution like SharePoint that would require configuration how would your definition of the FS differ if any. I mean Microsoft would have all the relevant documentation of SP so would the FS only contain the specific configuration components? Typically I produce a separate Configuration Specification to describe how a specific instance/deployment of an application is configured. For example, I once designed an app which was deployed as three separate instances, each with a different configuration. I produced one FS and three Config Specs (one for each instance). If you have *bought* a COTS product then in theory it comes with an FS and you only need to produce the Config Spec. SharePoint is an interesting one though, because it a very general purpose application that is so highly configurable that you can almost create new functions just by configuring it. In which case you might want to produce an FS after all. However, there is little point in re-describing all of the out-of-the-box features (unless your business users really wanted you to for their understanding). Rather, you would only describe the “interesting” bits – the bits that need configuring/building. For once I feel like I actually understand what goes into a functional spec. Thank you for a well-written article. I look forward to reading more of your articles. Keep up the good work. I didn’t quite understand your comment about non-functional requirements, you say they are “obviously not non-functional”. Does this mean that they are “obviously functional”? I suppose it’s a language/terminology thing. The term “non-functional” implies that NFRs are nothing to do with functionality. But actually they describe some aspect of the system’s functions (e.g. how long it will take to execute a given function, or what accessibility standards the UI will confirm to, or which functions a given user is authorised to use). Thanks Tony. Very very helpful article. Do you ever create the prototypes yourself as well? if so, how are you keeping track of the screens and how are you referring them in a Functional Specs document? I very much enjoyed the article. This is all fairly new to me and I simply like familiarizing myself with the language. I like the way in which you spelled out the concept and delineation of function and data – very helpful! Do you have any suggestions for writing FS for responsive website. Do I write FS for different break points – phone, iPad,…,etc.? I’ve never written an FS for a responsive website, so I can’t speak from experience. It really depends on what is going to work best for your developers and testers, and also how your are developing – incrementally? Agile? I would think there is some benefit in keeping the specs for the different UIs together in one place, because there will be a lot of commonality – they will share the same data store (single logical data model) and the functions will also be similar, if not identical. It would also be useful to have it all together so that you can easily see the total impact (across all user interfaces) of any changes that come along. That doesn’t necessarily mean one big Word document though – you might have a series of smaller “documents” (in Word, XL, or Visio) – perhaps one per function, but showing how the function works in each UI. My best advice is to try something and see if it works. So, pick a single function and spec it out across all UIs, get your developers and testers to work from it (ideally using incremental delivery, or perhaps a “pilot”), get feedback from them on the approach, and adapt. Thank you for such an excellent article. For the last couple of months I have been grappling over what to include in an FS and what not. Finally stumbled upon your piece. I’m now looking for what I would call the next level of documentation, the one that the developers would write before developing the source code and unit test codes. Do we call them technical specification? Do you have a guideline on what to include in those kind of documents? Personally I would encourage your development team not to produce technical specs – in my experience they take more time to do than they add value. This does, however, assume your development team are competent enough to code to the relevant coding standards for your project without it have to be written down for them. Agree this is a great definition for a functional spec. Taking this a step further, there is a close synergy between documenting a functional spec and documenting the current state of an application. My thinking is you should write the FS in the present tense so it becomes current state documentation after go-live. The FS should describe the changes to the current state. This can be used for training purposes. -enables documentation of the current state. -shows the future state which becomes the current state for a future project. Kind of like tracking changes in Word, except the tracked changes form the functional spec for the project. Are there any tools you know of that can do this? Atlassian Confluence comes close, but you need some way to group document changes into a “Project”. I’m with you re. use of present tense to describe future changes. To my mind, there are a number of benefits – firstly, as you say, once your system goes live, you are describing the current state in the present tense. Also, I find that writing that something “is” rather than “will be” or “shall be” or “should be” somehow makes it clearer to all concerned (especially developers) that this *is* what we are going to build, it’s not just some optional “requirements” document to be heeded or ignored at will. My main caveat is that I’ve become a lot more “agile” since I first wrote this article. I used be firmly of the opinion that there is a lot of value in having an accurate, detailed description of the current state. But it takes a lot of effort to maintain, and it’s so easy for documentation to become stale, and these days I’m less convinced whether the value of having the written description separately from the code itself (the code always tells the truth) – perhaps augmented with a suite of executable tests which tell the truth of what the system *should* be (rather than what it *is*). In terms of tooling and marking up changes, I’m a great believer in lo-fi tooling. Back when I used to write big specs I used to rely on MS Word but I used manual text colouring as opposed to “track changes” – for more details see http://www.its-all-design.com/a-new-approach-to-document-version-numbers/.